Blue Chip Stocks are a good choice for the wealth generation. Take an example of Maruti Suzuki. Maruti Suzuki is a blue-chip stock. The stock of Maruti was available at Rs.5700 in 2017 and today it is trading at Rs.9460.This means Maruti has generated 65% CAGR return for the investor in last one year. Maruti is not an exception, there are many blue-chip stocks like Britannia, Symphony and L&T have also generated a very good return for the investors in 2017. This would ideally mean that Blue Chip Stocks are good for investment. However, on the other hand, blue-chip stocks are very costly and historically blue chip stocks are worst affected stocks during the stock market crash. The chance of getting a multibagger return is slightly low in blue chip stock compared to small cap and mid-cap stock. So, what is Bluechip Stock? Is it worth for investment? Which are best blue chip stocks for investment in 2018? Should I invest in Bluechip Stock? Let’s try to figure out. What is Blue Chip Stock? Honest & Dynamic Leadership – These companies are led by an honest and quality leadership team who have decades of experience & proven track record. Proven Business Models – They have been around for several years and have established themselves as the leading players in their respective sectors. Investment in bluechip stock means access to the diversified business. Bluechip stock can give you steady long-term returns. The chance of scam or fraud is less in these type of stocks. These type of stocks are largely impacted by a stock market crash. The First blue chip stock for investment in 2018 is Maruti. Maruti is leading car manufacturer of India. Maruti is second best performing auto sector stock across world. Maruti is key beneficiary of alliance between Toyota and Maruti for electric vehicle. Most of leading brokerage house are bullish on the performance for Maruti. 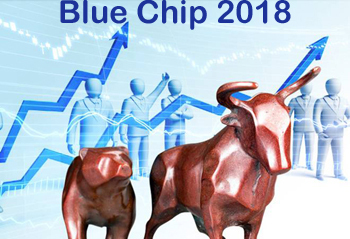 As per me it is best bluechip stock for investment in 2018. The second bluechip stock for investment in 2018 is L&T. L&T is leading engineering and Construction Company. A strong order book and execution track record is plus point of L&T. L&T is likely to shine in 2018. Although stock is slightly overpriced you can invest in the stock for long term prospective. Another stock for investment in 2018 is Avanti Feeds. Avanti feeds is high quality feed manufacturer. In past few years this stock has generated very good return for the investor. The growth story of Avanti Feeds is likely to continue in 2018. Britannia is next bluechip stock for 2018. Britannia is in the business of food manufacturing. Britannia is consistent performer stock. Rapidly expanding distribution, continuing investment in R&D and significant expansion of its own manufacturing indicate management’s optimism about the growth prospects. Still this stock contains potential. One can invest in this stock for 2018. TCS is leading IT service and Consultancy Company of India. The growth story of IT is likely to continue in the future. Historically TCS is consistent performer stock. If you want to invest money for long term perspective you can consider TCS as safe bet. As per me blue chip stocks are must for a stock portfolio. Few people are crazy about investing in small-cap and mid-cap stock. The reason could be Mid Cap and Small Cap stock can become multibagger in future. They should understand that investing in small-cap and mid-cap stock is a risky affair and not advisable for risk-averse investors. If you are new to the stock market or if you are a conservative investor looking for stable dividend income and wealth generation over the long run you should invest in blue-chip stocks compared to mid-cap and small-cap stocks. Bluechip stocks are like gold and silver in the portfolio. It is indispensable and should stay in your portfolio for the generation to come. Never invest in blue chip stock during a stock market boom, price of these stocks will be high during that time. Look at fundamental of blue-chip stock before investing. Never stay under impression that blue-chip stock always gives a better return. I hope you like my post on 5 Blue Chip Stocks for Investment. « Health Wallet by Apollo Munich – Should you purchase?